Click here for a handy glossary and dictionary of terms used by film editors and post professionals from Art of the Guillotine. Did you know that Adobe Media Encoder can upload a movie to an FTP server when encoding is complete? This is a great feature that many were unaware of ... until now. The FTP tab of the Export Settings dialog box allows you to upload the exported file to a File Transfer Protocol (FTP) server that has storage space allocated for file sharing. FTP is a common method for transferring files over a network and is especially useful for sharing relatively large files using an Internet connection. The server’s administrator can provide you with the details for connecting to the server. Server Name Enter the DNS or IP address of the server on which the FTP site is located. Port Specify the number assigned to the FTP server’s command port, which is 21 by default. Remote Directory Enter the location on the FTP server to access, expressed as a file path. User Login Enter the user’s identity, as designated by the server’s administrator. Password Enter the password to a password-protected server. Retries Specify the number of attempts to contact the server if a connection isn’t established. Send Local File To Recycle Bin (Windows) or Send Local File To Trash (Mac OS) Deletes the local copy of the exported file once it’s been uploaded to the FTP server. 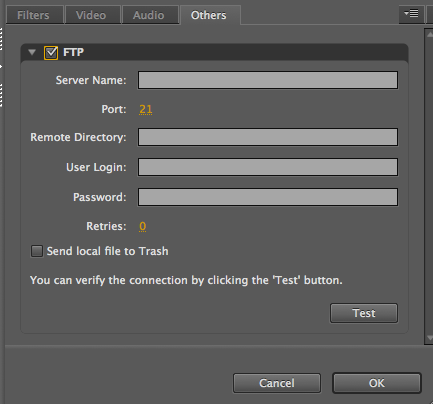 Test Verifies the connection with the FTP server. We're in the final stages of setting up a series of Forensic Photoshop classes in Pasadena, Ca. The first offering, tentatively scheduled during the second week of July, will be a 2 day Intermediate class. This class will be open to all (not just current LE employees), but limited to 25 students. If you want to get the first shot at the class seats when they open up, send me a note. Make sure to put "Forensic Photoshop Class" in the subject line so as to get by the spam filter. We'll be doing an e-mail blast in a few weeks once the details are set. Here's just a quick note to say that the Forensic Photoshop tour bus is stopping in OKC next week. I'll be in OKC, Edmond, and Guthrie, Oklahoma, spreading the Photoshop gospel. If you're in the area, shoot me a note. This just in from the Austin Statesman: "John Abraham waited three hours for a police officer to show up after someone broke into his East Austin home in 2009. He'd been gone about 10 minutes and came home to find his back doors kicked open and his laptop and other items gone. Abraham waited hours for an officer to respond, filled out a report and then never heard back from police. His property was never recovered. "I just didn't feel like I was a priority," Abraham said. "I can understand because we don't live in a violent crime city, but it's not cool to feel like police don't even care." Each year there are thousands of burglaries reported in Austin — last year there were more than 8,000 — and typically only 5 percent of them will end in arrest, with the victim's items being returned. The national average is 10 percent. Critics say there's more that could be done by the department to track down or follow up with burglaries, but police say a lack of staffing is keeping them from solving more. With 14 crime scene technicians on staff, police can only respond to about 45 percent of reported burglaries, said Bill Gibbens , manager of forensic science services for Austin police. Officers are trained to collect some evidence, however it's common for the more experienced crime scene technician to be called out, said Tim O'Brien, a property crime technician for the police department. He said he works on three to four burglaries a day. "Sometimes you can spend eight hours processing one crime scene," O'Brien said ..."
It's mildly interesting to read that staffing issues are to blame. I wonder why news agencies continually refuse to dig deeper to find out why - what's changed - and report that as well. I have a friend who lives in a nice neighbourhood in suburban Los Angeles. He was a victim of a burglary. When he called it in, he was told to just come to the station and file a report - that nobody would be dispatched and no investigation would take place. All he got was a police report to turn in to his insurance company. He asked me if he should buy a CCTV system. My response - if there's to be no investigation, what's the point of spending more money? This is the part of the story that the news media is missing - people's expectations for service not being met. If we're not solving crimes of this nature anymore, why not. Did we ever solve these types of crimes? How much would it cost if we wanted a "full service" police agency? This just in from Philly.com: "For decades, prosecutors have relied on crime-solving techniques such as fingerprints, ballistics analysis, and eyewitness accounts to put people behind bars, even on death row. Now, in the aftermath of the stunning impact of DNA testing, many of those time-tested methods are under legal attack. In Philadelphia, Kenneth Mapp, 35, is fighting a robbery charge filed after police concluded that a partial print lifted from a pizza-restaurant heist came from his right pinkie. His lawyer will dispute the scientific validity of fingerprint analysis at his forthcoming trial. From Pennsylvania's death row, convicted murderer Daniel Dougherty, 51, is hoping to be freed based on his contention that "junk science" led a jury to convict him of setting a fire that killed his two sons. And with mounting proof that eyewitness accounts are often wrong, New Jersey is examining how such evidence should be used, while a Pennsylvania committee is expected next month to make recommendations aimed at preventing wrongful convictions. Fingerprint and firearm analyses, arson investigations, and forensic conclusions about bite marks, footprints, and hair and fiber comparisons have, in varying degrees, all been called into question. There are even growing concerns about what was once considered unassailable evidence of guilt - a confession. "People in the criminal justice system, including judges, have a lot more skepticism than they once had," said Philadelphia Common Pleas Court Judge Benjamin Lerner, who has presided over criminal cases for more than 20 years. The legal challenges around the country are an outgrowth of the revolutionary impact of DNA testing, which has freed 267 prisoners nationwide, including 10 in Pennsylvania and five in New Jersey, and caused four states, including New Jersey, to end the death penalty. Eyewitness testimony was a factor in the convictions of 75 percent of those exonerated through DNA testing, according to the New York-based Innocence Project. Faulty forensic evidence contributed to 50 percent of the convictions. The project said that 25 percent of the defendants later found innocent had confessed or pleaded guilty, and that jailhouse informants were a factor in 15 percent of the overturned cases. Despite the popularity of TV's CSI shows, many of the forensic methods used in modern crime-solving also took a hit when a National Academy of Sciences report said that all too often, forensic evidence was presented in court "without any meaningful scientific validation." The need for improvement was "tremendous," said the 2009 report, which called for uniform standards, certification, and peer-reviewed research to ensure greater reliability. It said that in fires, for example, "rules of thumb" pointing to an accelerant being used "have been shown not to be true," and limitations of fingerprint identification may also have led to wrongful convictions. The idea of bad forensics is nothing new to James McCloskey, the founder of Centurion Ministries in Princeton, which has won the release of 40 prisoners since 1983. "Forensic evidence is like gold" in courtrooms, he said, and it can be extremely difficult, even impossible, to successfully challenge faulty scientific conclusions after a jury's verdict. Pennsylvania, he said, is one of the toughest states for a defendant to challenge a conviction based on new evidence. David L. Faigman, a professor at the University of California Hastings School of the Law, said one day people would look back with dismay on all the defendants convicted of crimes based on "pseudoscience" and old-fashioned techniques. "Our children's children . . . will say the legal system was profoundly ignorant about science," said Faigman. "We're turning a corner, but like a luxury liner, it takes a long time to change direction. And there are a lot of hurdles." He said few states are "forward thinking," though New Jersey's decision to review eyewitness identification makes it a standout. Law enforcement officials defend the integrity of many long-used investigative techniques. If anything, "the technology has been enhanced by advancements in science," said Upper Darby Police Superintendent Michael Chitwood, a former homicide detective in Philadelphia. Dauphin County District Attorney Edward Marsico, president of the Pennsylvania District Attorneys Association, said he didn't buy all the National Academy of Science findings and still had faith in evidence like fingerprint and ballistic analyses. "Are there false confessions? Sure. Are there bad eyewitness IDs? Absolutely. What's the best way to combat that? We're not sure," Marsico said. That is precisely the dilemma facing courts ..."
Click here to continue reading this story. Enjoy. This just in from the IAI: "The International Association for Identification (IAI) Video Certification Study Committee is announcing a certification in Forensic Video. IAI certifications conform with Forensic Specialties Accreditation Board, Inc. (FSAB) requirements for certification programs. The IAI certification guidelines require an initial certification test to seat the first Forensic Video Certification board, which will consist of participants selected by the IAI President who have passed this initial test. In addition to the board, those that are not selected to sit on the certification board will be certified for a term of five years. This initial test will consist of a written examination only. The practical portion will be prepared by the first board. All participants who take this initial test will be required to take and pass the subsequent practical within two years of receiving certification or the certification will be voided and revoked. Once a video certification board is seated, subsequent tests will consist of both a written test and a practical. The goal is to have the next test (including the practical portion produced by the certification board) at the IAI conference on August 7-13, 2011 in Milwaukee, Wisconsin. IAI membership is not required for certification, but is necessary for participation on the Forensic Video Certification board. As the overall goal of this first test is to seat a video certification board, please strongly consider offering to be selected to sit on the board ..."
Confused? It sounds like the first test is being given to create a panel that will create the actual test. So, if you want certification from the IAI, but you don't want to sit on the creation panel ... chances are the IAI won't choose you for one of the limited spots at the testing centers next month. Next month? Yes, next month. The tests are just a month away. If you want to get involved, you have one month to find the recommended texts, prepare, book flights/rooms, etc - and get your application package together and approved by the IAI. So, if you really want to sit on this panel, you best get your application in today (if you aren't an IAI member and you want to be on the panel - what are the chances of getting your membership approved in time? - but I digress). There's no indication as to when interested parties will be notified that they've been accepted. Given the current state of fuel prices, airline fares are through the roof. This factor alone may limit representation to those within driving distance to Las Vegas and the DC Metro area. Coincidence? I'll leave the fact that the first recommended book's been out of print for over 10 years and copies of the recommended edition are a rare find on the internet. There's no indication if earlier editions are acceptable - given that the questions will likely come word for word out of the books. I'm guessing that the feeling of the IAI is that anyone interested in creating the certification tests should already have these "holy" books. If you don't, and you want to join the process - you'll have to fight it out at Amazon and Abe for the few copies there are out there. What concerns me most about the process is the lack of "community involvement." By that, I mean there are many who are involved in the discipline at a "high level" who could be called upon to help craft this certification. People with a wealth of experience in not only the fundamentals of CCTV and video (the recommended reading focusses almost entirely on video/CCTV theory - along with the flip book) but also with the LAW. Assuming that a IAI certified forensic video analyst will eventually end up in court with his/her work product, I'd feel more comfortable with a test that covers the breadth of our experience. Better still, think of the way the SWGs and the IACP, and other groups work. They go out and find the stakeholders, policy makers, movers, shakers, etc ... and put them in a room together. Some big agency funds the meetings so that smaller agencies aren't excluded from providing valuable input. (will the IAI pay for the panel's continuing participation? there's no indication - and that funding commitment is critical for many agencies) They go forward and produce valuable products. Think the flip book, the SWGs, and the standards that IACP/NIJ/NIST help put out. Here, if you want in ... you or your agency has to pony up the funds for the trip and the test. I'm a big fan of inclusive policies - and this isn't inclusive. The other issue that begs asking is this - does the industry necessarily need another certification? The LEVA CFVA program has been around for a while now and they've added the technician level certification. Is competition for our scarce resources a good thing or a bad thing at this point? Is the IAI necessarily saying that there's something wrong with the LEVA program by introducing their own? As small a community as we are, are we better divided or united in pursuing standards and certification? Do I really need to pay dues to another group? And speaking of dues ... out here the IAI's image related educational offerings are limited to a latent print imaging specialist showing folks how to use Photoshop to develop latent prints - and use his plug-ins. Certification needs a supporting cast of continuing education. Will the IAI expand their educational offering? I was a member for years, but cancelled recently - frustrated over the lack of video/DME related educational programs. IAI is known for LP, Crime Scenes, and Photos. Is their bench deep enough to pull off Video/DME? Since the announcement on the list last week, I've received not a few queries about this new certification - the bulk of which are encapsulated in this post. I'd be interested to know if you are planning on attending - how easy the process is/was for you. If you aren't attending and you are qualified - why not. This just in from Adobe's Dave Helmly: "Recently I’ve been getting a lot of performance questions from Mac users about using Premiere Pro editing systems with ATI/AMD graphics cards. No question this has been “sparked” by Apple’s recent series of MacBook Pro Laptops featuring Thunderbolt and a 1GB AMD Radeon 6750 graphics card. Below is a link (Click picture) to show the Mercury Playback Engine running on the new Apple MacBook Pro 17” Thunderbolt laptop in 64 bit CPU mode or what’s also known as Mercury Software mode. In software mode, Premiere Pro will use its 64 bit playback engine along with OpenGL to give you a great playback & rendering experience. Apple is now finally shipping a fast processor with 8GB of system RAM and 1GB of GPU RAM on a laptop. As you’ll see in the 9 minute video, for many workflows with 2 or 3 layers of video , Mercury Software playback will fit their needs perfectly. With newer Intel processers and fast hard drives, Mercury software playback can render Titles, transitions, PSDs, and effects like Ultra Keying, and Color correction (Fast Color Corrector) in real-time. As you’ll see in the video, playback is very smooth ..."
Continue reading by clicking here. Enjoy. The Court Courts Confusion in Confrontation? From Marquette's Daniel Blinka: "In some ways I should be grateful for doctrinal train wrecks. Messy case law provides endless excuses for writing articles and blog posts as well as delivering lectures that purport to see “the way” through the swamp. Like a child’s kaleidoscope, such cases offer something different for everyone to see, and no one is clearly wrong. Yet Supreme Court opinions are not solely intended for the entertainment of academics or the bewilderment of law students and lawyers. A jury convicted Bryant of murdering Covington. Police testified that they received a dispatch that a man had been shot. They found Covington bleeding from a fatal stomach wound at a gas station. When officers insightfully asked “What happened?”, Covington replied that Bryant had shot him through the door of a house some blocks away from the gas station. He repeatedly identified Bryant as the shooter before medical help arrived; Covington died a short time later at a hospital. The key issue at trial was the identity of the shooter. The trial judge admitted Covington’s statements to police implicating Bryant as the shooter behind the door. What’s confusing you ask? Well, Bryant’s trial occurred under the aegis of Ohio v. Roberts, a 1980 case which held that only “reliable” hearsay could be used against an accused at trial. Under Roberts, Bryant’s conviction comported with his Sixth Amendment right to confront his accusers. In 2004 the Supreme Court overruled Roberts and most (not all) of its progeny because Roberts rested on an erroneous, or so we’re told, understanding of the confrontation right. That 2004 case, Crawford v. Washington, held that the confrontation right applied only to “testimonial” hearsay, a term it declined to define. Testimonial hearsay could be used against the accused only if he had a prior opportunity to cross-examine the hearsay declarant and that declarant was unavailable to testify. Nontestimonial hearsay is largely left to the rules of evidence. Bryant appealed his conviction on grounds that Covington’s hearsay statements to police violated the Crawford rule. Since it was undisputed the Bryant had never cross-examined Covington before his death (duh), Michigan’s supreme court reversed the murder conviction because it found the hearsay “testimonial.” The Supreme Court granted certiorari. To many observers, Bryant promised to illuminate a possible dying declaration exception to the Crawford rule that had cropped up in earlier dicta, much as the Court had fleshed out an exception for “forfeiture by wrongdoing” several years ago in Giles v. California, 554 U.S. 353 (2008). Instead, the Court sidestepped the dying declaration exception on grounds that Michigan had abandoned it, ruling instead that Covington’s dying responses to police questioning about his killer’s identity were not “testimonial” in the first place. In sum, the Michigan court erred because Bryant’s confrontation right did not attach to Covington’s hearsay. The rambling majority opinion by Justice Sotomayor heroically attempts to guide us to an understanding of what constitutes testimonial hearsay, at least in the context of “a nondomestic dispute, involving a victim found in a public location, suffering from a fatal gunshot wound, and a perpretrator whose location was unknown at the time the police located the victim.” Whew. Space limits preclude any full elaboration, yet three points stand out. First, testimonial hearsay’s essence turns on whether the declarant’s “primary purpose” was to provide “evidence” (my word) for a criminal investigation or prosecution. Second, the primary purpose is determined objectively; the declarant’s subjective (“actual”) motives are not controlling. Third, this objective approach is based on the totality of the circumstances, which means that we must look at literally everything. And the combination of these three elements – “primary purpose,” objective assessment, totality of the circumstances – spells only one thing: the standard for testimonial hearsay is manifestly uncertain, offering little, if any, predictive value. If Crawford offered hope for criminal defendants that there was some rigor in the confrontation right, Bryant invites prosecutors to litigate the threshold issue of whether the hearsay is testimonial in a breathtakingly wide array of cases. In other settings the Court has decried “litigation lotteries” advocated by the defense (e.g., the “no knock” cases), but Bryant provides little incentive for prosecutors not to litigate this issue. Click here to read the article and access the linked cases. To keep up with the latest Audition developments, follow the Adobe Audition Facebook page, Twitter feed, and Inside Sound blog. Enjoy. If you're not on FB, here's a reason to join the discussion: "The Premiere Pro team is using Twitter and Facebook to give and receive information about Premiere Pro. The team Premiere Pro Twitter account goes by the name adobepremiere. Follow us. Our Adobe Premiere Pro Facebook page has been active for a while now. Become a fan. Or friend. Or like us. Or whatever that’s called ..."
This in from Macworld.com: "A technology built into many new solid state drives (SSDs) to improve their storage efficiency could inadvertently be making forensic analysis at a later date by police forces and intelligence agencies almost impossible to carry out to legally safe standards, researchers have discovered. After examining an SSD for traces of data after it had been quick formatted, the team expected the purging routines to kick in around 30 to 60 minutes later, a process that must happen on SSDs before new data can be written to those blocks. To their surprise, this happened in only 3 minutes, after which only 1,064 out of 316,666 evidence files were recoverable from the drive. Going a stage further, they removed the drive from the PC and connected a 'write blocker', a piece of hardware designed to isolate the drive and stop any purging of its contents. Incredibly, after leaving this attached for only 20 minutes, almost 19 percent of its files had been wiped for good, a process the researchers put down the ability of SSDs to initiate certain routines independent of a computer. For comparison, on the equivalent hard drive all data was recoverable, regardless of the time elapsed, as a forensic examiner would expect. "A few people in the forensics community had some awareness that something funny was going on with some SSDs, but everyone we've shown this to has been shocked at the extent of the findings," said co-author Graeme Bell by e-mail to Techworld. The team warns that as USB sticks grow in capacity, manufacturers could start integrating similar purging technologies into them, duplicating the same problem for a second set of storage media. Bell and Boddington also believe that 'garbage collection' routines will become more aggressive over time as manufacturers start using more powerful firmware, chipsets and larger-capacity drives ..."
While certainly not a "forensic" process - I've seen some pretty bad composites submitted for retirement flyers and whatnot. Here's a good video on the basics of composting in PS CS5. Check out this interesting video series from LifeHacker's Adam Dachis. This just in from DFI News: " ... Real world laboratory use, controlled internal tests utilizing scientific principles, and peer review should all be leveraged in a validation test plan. Sharing unique results with the digital forensics community at-large helps investigators, examiners, and even software and tool vendors ensure that current best practices are followed. As the field of digital forensics continues to grow and evolve as a science the importance of proper scientific validation will be more important than ever." This just in from Adobe's Photoshop FB page: "Photoshop CS5 almost didn’t happen. Check out this video for an inside look at the months leading up to the launch and how the team rallied to hit our ship date."